T: I believe all the Tenchi fans around the world will be very exciting when they know that AIC IS going to produce the 3rd series of “Tenchi Muyo!Ryohki” OVA. Is there anything you “must” address here for AIC to all the supporters before we start the interview? K: Yes. There is. On behaves of AIC, I officially announced that the 3rd “Tenchi Muyo! Ryohki” OVA series IS direct by me-Masaki Kajishima. And the 3rd “Tenchi Muyo! Ryohki” OVA IS the sequel of Kajishima’s original “Tench Muyo! Ryohki” OVA. T: Let me repeat here again that YOU ARE going to produce a real Kajishima “Tenchi” world, right? K: Yes. The 3rd “Tenchi Muyo! Ryohki” OVA WILL direct by me and remain the originality of Kajishima’s “Tench Muyo! Ryohki” world. T: Thank you. If there is no other things you “have to” say on behaves of AIC(grin). Let me start our question from the story of “Tenchi Muyo! Ryohki” the 3rd. I know that you already have the big picture of the ending in your mind. Will you put all of your ideas in the the 3rd series this time? K: Basically, the story will start from clear out the mysteries I left in the former OVA series, such as who are Goddesses named “*Choushin “, why they are there…etc. And the story will move on to Tenchi himself after Goddess ended their war. The story of Tenchi will have nothing to do with “fighting”. T: What will happen after the battle between Goddesses? T: We understand that you can’t say much about the ending at this moment. Let me ask you this, do you have the ideas of “Tenchi Muyo! Ryohki” the 3rd when you were directing “Tenchi Muyo! Ryohki ” the 2nd? Or you have the ideas after the second series? K: I had the ideas way back to “Tenchi Muyo! Ryohki” the 1st and I already knew how to end the story when I was directing “Tenchi Muyo! Ryohki” the 2nd. I just don’t have the detail about how to connect each images and fragments of the base storyline in my mind. It’s just an outline, not very specific. T: Do you have it now? K: No. (Laugh). I only know where the goal is, but have no clear idea how to get there. But, I have decided “where” I would or should pass to reach the goal. T: In other words, you are going to enjoy the “fun” of connecting the images and fragments from now on. K: Yes. That is right. I will fix or change the detail depends on my chose. But the basic concept of the ending had been made. That will never be changed. T: Will all the characters in “Tenchi Muyo! Ryohki ” so far be deeply involved in the story and be quite active this time? K: “deeply involved in and be quite active”…um…they will not be THAT active as usual. Tenchi is the main character and the center of the story. He has to settle everything by himself. T: Can we interpret what you said into, there is somebody Tenchi has to upfront with, some trouble things happened that he has to deal with, meanwhile Ryoko and other characters will involve in the chaos, is that right? T: Then, do you mean Washu, Tsunami and Tokimi will become the main characters of the story? T: For most of the audiences and fans, will it be difficult for them to understand the existence of “Tokimi”? K: Well, I can only say she is a Goddess, one of the “Choushin”. T: Have you decided the real name of “Z”? K: Not yet. I just called him “Z” at this moment. T:In my understanding so far that the basic story will start from telling Tenchi’s upbringing, his destiny. At the same time, deal with many things, and finally, fight with Z. is that right? K: It’s not only about Tenchi’s destiny. Its also about 2 men’s fates that has been taunted by Goddess’s purposes and determined by Goddess that they have to fight. The whole story will be develop from that basic concept. T: Its pretty rare to have the story mainly developed from 2 men’s fates. K: But remember, Tenchi fought with Gakato at the end of 1st “Tenchi Muyo! Ryohki” OVA series. In certain meaning, the 3rd Tenchi OVA has the similar ending as the first series. T: Tenchi is born as normal human beings. He get to know many things after grown up and without choices, he accept his fortune and involve with many people. I think He is a very typical “reluctant hero”. K: That is correct. He is caught in something too this time. It’s about some emotional factors of “Z”. T: In other words, “Z” has the same fortune as “Tenchi”, right? K: He is, too, in certain meaning, a victim of Tokimi. K: I don’t know if you can put it that way. I mean “bad”. She is the most hardworking Goddess among 3 Choushins. Tokimi is seriously putting Choushin’s original purposes into action. As the result of their “purposes”, “Z” becomes the victim. T: “Z” sounds like a ponderous character to me. K: “Z” belongs to Tokimi, but he doesn’t like her at all. T: Let’s back to Tenchi. Normally, not many people can stand with that kind of chaos life long. A normal human being will get crazy pretty soon if he has to deal with so many troubles. K: Well, Tenchi has the destiny to be so. Therefore, at the moment Tenchi decided to live with Ryoko and other people, he already made up his mind. T: He simply accepts his fates, right? K: People may surprised to know that, “Tenchi Muyo!” anime is not the story about how Tenchi grown up. Because Tenchi already gave people his answer in the very first beginning. T: Really? Its looks like the other way to me. I just watch that animation as normal audience and the story so far is using many things, like, “what will happen to Tenchi?”, “Who is he going to be with?” to tickle fans’ curiosity. K: As I said a while ago, girls don’t know Tenchi already has the answer. But I am planning some episodes after the war between Goddess to explain that. I am thinking of girls are forcing Tenchi to make up his mind to chose one among them. T: That’s a BIG news for fans. K: His decision will be the biggest break point of “Tenchi Muyo!” And end the Chapter one of OVA series. T: Tenchi is chased into a life that he can’t make the choice as a normal male human being. Or I should say his destiny has determined what he has to go through. Tenchi is not allowed to have his own will and it all caused from his environment and fates. He must go through good and bad things. Will Tenchi’s life changed in the 3rd OVA series? T: Then, Tenchi Muyo! Ryohki the 3rd is base on the conflict between Tenchi and “Z”, and the rest of the stories will be influenced by the purposes of Goddesses. K: Also about how Tenchi is going to deal with all that. T: I think the male fans are curious about Tenchi’s “love life”, you know what I mean (grin). In what situation that Tenchi have to choice is the most mystery and interesting part for us. T: For fans of the Tenchi-Muyo! series two of the most popular aspects include the constant question of “Who will be Tenchi’s love interest?” and the unique science fiction-style battles. K: Well, I’d say that it’s a fantasy, because the sci-fi aspects of Tenchi are too abstract to be classified as true science fiction. T: The audience seems to enjoy the fact that some of the story remains unexplained, it allows them to discuss the endless possibilities and let their imagination run wild. T: The sci-fi portion cannot be too unbelievable and at the same time the people responsible for creating the work are worried at how their imaginations will be reflected in the audience’s eyes. In the end, these two factors combined can result in a surprisingly boring anime. K: Correct. Dreams are being limited due to the development of civilization. There are dreams that people have about the world around us, but those dreams can suddenly become too real and lose their mystique. For example, a long time ago Africa conjured thoughts of adventure and excitement because it was so mysterious. Nowadays there is nothing in Africa that can tickle the imagination in such a way. T: Science has become too developed and the overflow of information has filled their minds to the point where they can’t free their thoughts to dream something very different. K: For example, the story of “Jungle Emperor Leo” has a lot of romance to it, but if you were to think of a lion becoming king today your mind would also conjure the reality of modern buildings near his kingdom. T: There are no unexplored frontiers on earth. K: It’s the same thing with the universe. It can’t help narrow your view of the world. T: It takes guts and hard work to create your own fantasy world, because, though difficult, it’s easier to create a setting that is based on actual science. K: There are a lot of people who can’t convey what they imagine. Those that are able to take what they imagine and explain it to others really possess something amazing. People don’t realize how special that ability is, because they can’t think of things in the same way. T: Yes, especially when it comes to creating art. If you can’t convey your imagination, what can you do?Tenchi covers everything from daily life, the universe, and ancient history. It allows the wings of your imagination to stretch out and that feeling of freedom is one of reasons why it is so popular. K: That’s why I said Tenchi should be categorized as fantasy. T: Now I understand why you classify it as fantasy. K: In Tenchi’s world, magic IS science. It’s “science” is incredible for it accomplish something you can’t do in normal life. T: Why can’t others see thing in the same light as you. So, in your opinion the hook of OVA #3 is not about how Tenchi matures. K: Yes, that’s correct. Tenchi himself already knows his true purpose and only has to clear the obstacles that lie in between him and his goals. So, he isn’t bothered by what his purpose is since that is crystal clear to him, rather he’s bothered by the obstacles. T: To the audience, Tenchi appears to be very indecisive most of the time until a crisis arises and suddenly he becomes very reliable. K: What is Tenchi’s purpose? These are normal things but it will be revealed in the end. When Ryoko and other girls finally discover Tenchi’s purpose they will be stunned and astonished. T: Because they expecting Tenchi’s purpose to be greater than what it actually is? K: No, it’s not like that. 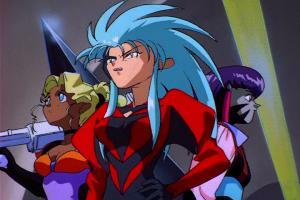 It’s impossible for Ryoko and the other girls to hold that much expectation towards Tenchi. Tenchi is thinking of something (ahead/further of Ryoko) further than what they are thinking now. That’s it. T: Can you tell us some hints of what is the final purpose of Tenchi ? K: No. I can’t. That is the secret of the story. T: I see. So, you are telling our fans just wait and see? T: Oh really? (laughs) Will it be difficult for you to chose the way to conclude the story after such a long time? like, who Tenchi should be with and the reason why he chose that particular one. K: I think our audience will understand my way of end the whole story. But , some people may not. T: Will it be something that will surprise us by the meaning and the way it shows? Will it be something not that fancy or dramatic? K: Um…recently, I have the feeling, like, ” I knew things is going to be like this!” to the ending that I already had 7 years ago. Before that, I might feel ” oh! Things will end in this way, uh?”Because I already have the answer that I hope our audience understand that I have no intention of fooling, disappointed our fans when they know the ending. T: Its means that you are not going to change the end, right? T: I think you are telling our fans that you will leave that part to their imagination. By predicting Tenchi’s love life, the secret of the story and watch your decision will be a great fun for them from now on. Let’s talk about your 2 other new projects that will show before and after Tenchi. K: Well, it is “NEW” but both use the view of world in “Tenchi Muyo!” One of the projects is little different, though. T: How about the Galaxy police? The title makes me feel like it has a lot to do with the world of Tenchi. K: Most of the characters are from the novel of “Galaxy police”. If you read the books, you will have better understanding of this new Galaxy police animation. Tenchi Muyo! has a deep background. Such as, Jurai and the “Academy”, but “Tenchi Muyo!” only focusing on what happened around or in Tenchi’s family. T: It means that you are going to choice one “stage” in the back story and make it a anime series. There are 2 Galaxy polices in Tench–Mihoshi and Kiyone. Will any characters in Tenchi shows up in “Galaxy Police”? K: No. Not many characters in Tenchi will show up in “Galaxy Police”. T: Will some people related to Mihoshi show up in the story. K: All I can say is, I have no plan to change my original design. K: Originally, I want many writers use the back story and create”Tenchi” world together. Like RPG games that writers can change the storyline as long as they are not interfere the main storyline. K: I simply want it become an adventure comedy. The leading male character in Galaxy Police is a young male human being named “Seina”. He is involved in many things as Tenchi. A girl who is the best friend of Tenchi’s relative misunderstand Seina as one of Masaki Family’s member and ask him to join GP. That is where the GP story starts. Part 3 of interview can be found here.